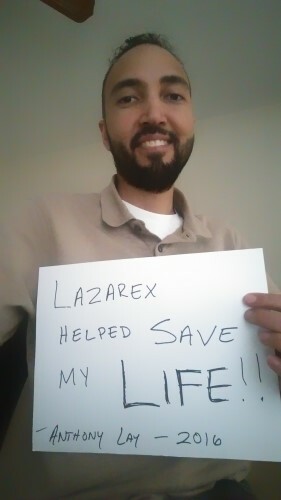 My name is Anthony Lay, and the following is my testimonial about my battle with cancer and the help I’ve been receiving though the great people at Lazarex Cancer Foundation and their donors. In October 2011, just four months after I got married, I was diagnosed with stage IV Hodgkin’s Lymphoma after I went to my primary doctor because I was suffering from chest pain. I was then referred to a local Oncologist here in Orlando, FL and told that even though the disease was at stage IV, it was still curable. We started the treatment involving six months of aggressive chemotherapy followed by one month of radiation therapy. Once that regimen was completed, I went in for a PET scan and unfortunately, the disease was not cured. My oncologist said I would have to do a stem cell transplant, so I did. This, if I may add, was one of the worst experiences of my life. I nearly died in that hospital because I caught an infection when my white blood cell count was at zero. Thankfully, I was able to pull through, and when I was released, the disease was finally in remission. Six months later, I went in for my routine PET scan. When the doctor came into the exam room, he had bad news for me. The lymphoma had returned and the next plan of action would have to be another year of chemotherapy followed by another stem cell transplant. My family and I were devastated. Not only would I have to go through hell again, but this time it would be more complicated because this transplant would be different since now we would have to involve a donor. There are much more risks this time around. I was totally scared because I didn’t know if my body would reject the donor’s cells, or if the procedure would even cure me, or if I’d even survive the procedure. There were no guarantees. Plus this would be my last resort. My doctor was ready to start right away, but something in my gut was telling me to hold off and think about exploring other options. After consulting with family, friends, and lots of prayer, I felt led to get a second opinion. However, I didn’t know where to go. I went online to find the best doctor for me to see. After lots of research, I found my current oncologist at Columbia University Medical Center in New York City. I called and they accepted me right away. They said a second transplant would not be necessary and I’d be a perfect candidate for a clinical trial they are running for people with recurrent Hodgkin’s Lymphoma. I was really excited but discouraged at the same time because I knew I couldn’t afford to constantly take trips from Florida to New York. That is when I truly felt God intervened in my life. After the consultation with my doctor at Columbia, I spoke to a patient advocate who told me about Lazarex. When I called Lazarex and spoke to one of the coordinators, she told me about how the program works and how it can help me. She said all I had to do was submit some paperwork and I should be good to go. When I hung up the phone with her I was in tears. I felt like my life was given back to me and my feeling of joy was overwhelming. Fast forward to the present day, I am still traveling to NYC and undergoing treatment that is not toxic like chemo and allows me to live a normal life and feel well. I’m under the care of Dr. Jennifer Amengual (aka the best doctor EVER!!) and her team at Columbia University Center for Lymphoid Malignancies. Not only are they all excellent doctors, but I feel the genuine care they have towards me and all the other patients. They treat me like family and not just another case. Words cannot express my love and gratitude to Dr. Amengual and her staff. I also cannot express the appreciation I have for the good folks at Lazarex Cancer Foundation and their donors. Without you, I’m not sure if I’d be around to share my story. With your support, I will continue to fight until WE overcome this. My eyes are literally watering as I’m typing this. All I can say is thank you and God bless you all. Anthony continues to respond well to his clinical trial treatment! 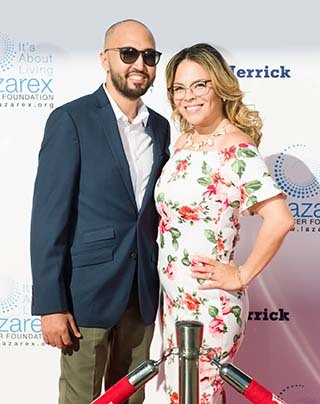 He and his wife attended the Lazarex gala in 2017 as patient ambassadors.